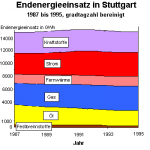 Stuttgart’s current energy consumption (the total final energy consumption is the energy used by the consumers before its last conversion) is about 14,900 GWh per year. The specific energy consumption per inhabitant is about 27 MWh per year and lies about 19 % below the average consumption of the former West German states (33 MWh per inhabitant) and about 5 % below that of Baden-Württemberg (29 MWh per inhabitant). The household and small-scale consumer sector (households, trade, services, public and city buildings, etc.) is the main total final energy consumer in Stuttgart. In these consumer fields, about 80 % of the total final energy is used for room and water heating. The industry’s share of total final energy consumption (all businesses counting among the processing industries with more than 20 employees) is “only” about 15 %. Room heating makes up the major part (52 %) of the total final energy consumption in Stuttgart with about 7,700 GWh per year. Process heat generation in industry requires another 1,000 GWh per year. The major part of energy (about 2,900 GWh per year) is used in the field of power / light. A total of 3,300 GWh per year, mostly in the form of fuel, is used for traffic within the city of Stuttgart. This means that traffic has a share of 22 % of the total final energy consumption. The energy Stuttgart’s trams require has a share of about 2 % of the traffic-related total final energy consumption. Oil and coal have a share of only 18 % of the energy consumption, which is significantly less than in the former West German states (about 26 %). The reason for this is the high percentage of natural gas and district heating systems. The industry sector only plays a minor part. Nuclear energy plays a comparatively important role. The development of the total final energy consumption during the last 5 to 10 years shows that all current efforts to save energy have very little impact on the total final energy consumption. The processing industries are the only field which shows significant energy savings. However, the reduction of the energy consumption in this sector can, besides the energy saving efforts made by the industry, be ascribed to the cyclical slump in production and the decreasing number of businesses. This figure shows that, in terms of the different energy sources, fuel (-24 %) and solid fuels (-49%) were mainly replaced by gas and electricity (each +14 %) and district heating (+7 %). Fuel consumption in traffic dropped by about 5 % between 1990 and 1995.